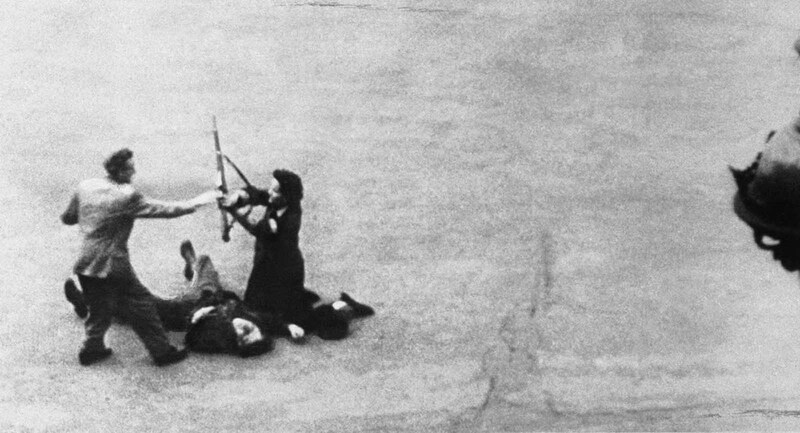 Symbolic of the defense of Sevastopol, Crimea, is this Russian girl sniper, Lyudmila Pavlichenko, who, by the end of the war, had killed a confirmed 309 Germans — the most successful female sniper in history. The Second World War changed the United States for women, and women in turn transformed their nation. Over three hundred fifty thousand women volunteered for military service, while twenty times as many stepped into civilian jobs, including positions previously closed to them. More than seven million women who had not been wage earners before the war joined eleven million women already in the American work force. Between 1941 and 1945, an untold number moved away from their hometowns to take advantage of wartime opportunities, but many more remained in place, organizing home front initiatives to conserve resources, to build morale, to raise funds, and to fill jobs left by men who entered military service. The U.S. government, together with the nation’s private sector, instructed women on many fronts and carefully scrutinized their responses to the wartime emergency. The foremost message to women—that their activities and sacrifices would be needed only “for the duration” of the war—was both a promise and an order, suggesting that the war and the opportunities it created would end simultaneously. Social mores were tested by the demands of war, allowing women to benefit from the shifts and make alterations of their own. Yet dominant gender norms provided ways to maintain social order amidst fast-paced change, and when some women challenged these norms, they faced harsh criticism. Race, class, sexuality, age, religion, education, and region of birth, among other factors, combined to limit opportunities for some women while expanding them for others. 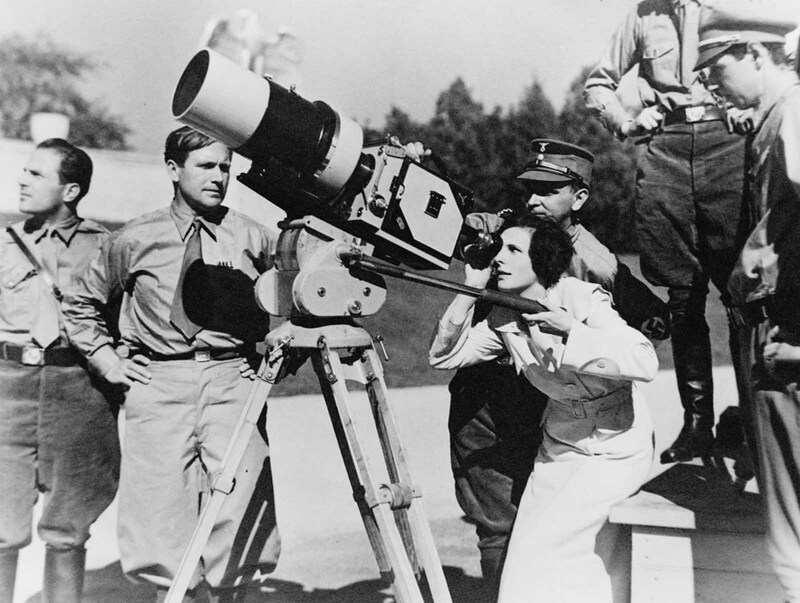 Filmmaker Leni Riefenstahl looks through the lens of a large camera prior to filming the 1934 Nuremberg Rally in Germany. The footage would be composed into the 1935 film “Triumph of the Will”, later hailed as one of the best propaganda films in history. Several hundred thousand women served in combat roles, especially in anti-aircraft units. The U.S. decided not to use women in combat because public opinion would not tolerate it. 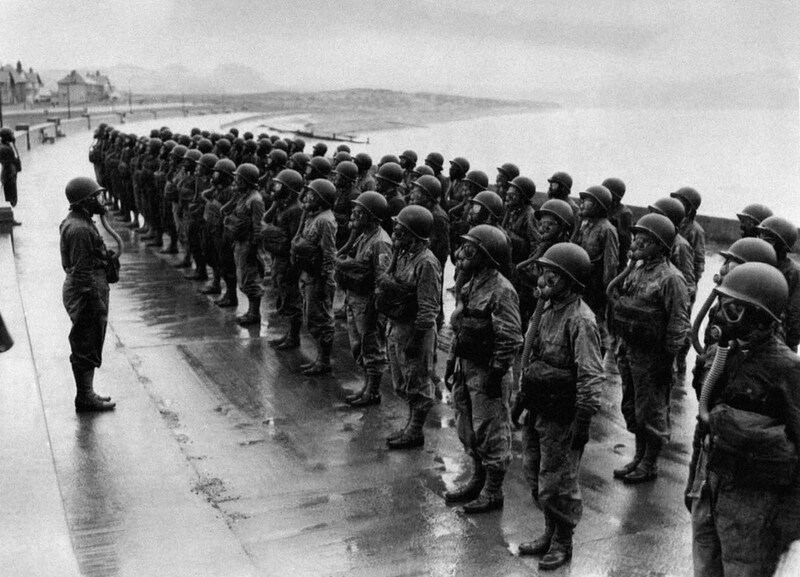 However 400,000 women served in uniform in non-combat roles in the U.S. armed forces; 16 were killed by enemy fire. 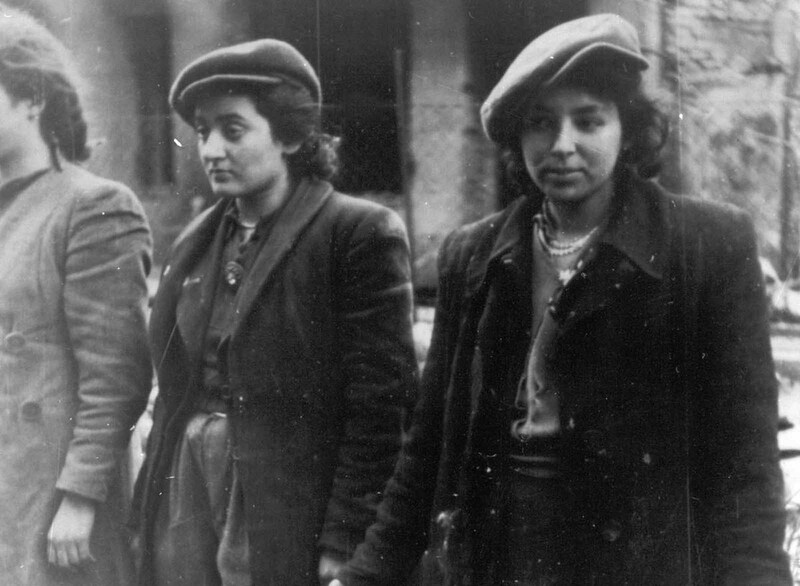 Many women served in the resistances of France, Italy, and Poland, and in the British SOE and American OSS which aided these. Japanese women look for possible flaws in the empty shells in a factory in Japan, on September 30, 1941. Other women, called comfort women, were forced into sexual slavery by the Imperial Japanese Army before and during World War II. The name “comfort women” is a translation of the Japanese euphemism and the similar Korean term wianbu is a euphemism for shōfu whose meaning is “prostitute(s)”. Estimates vary as to how many women were involved, with numbers ranging from as low as 20,000 to as high as 360,000 to 410,000, in Chinese sources; the exact numbers are still being researched and debated. 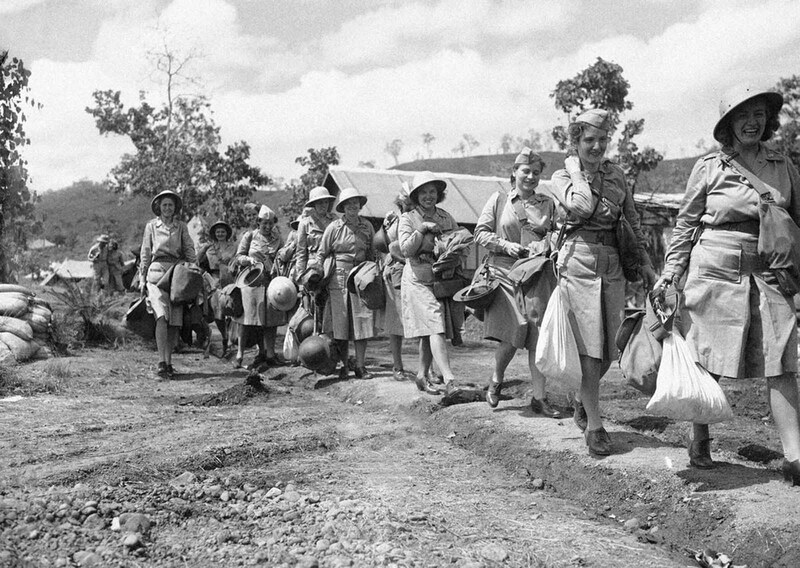 Many of the women were from occupied countries, including Korea, China, and the Philippines, although women from Burma, Thailand, Vietnam, Malaysia, Taiwan (then a Japanese dependency), Indonesia (then the Dutch East Indies), East Timor (then Portuguese Timor),and other Japanese-occupied territories were used for military “comfort stations”. Stations were located in Japan, China, the Philippines, Indonesia, then Malaya, Thailand, Burma, New Guinea, Hong Kong, Macau, and French Indochina.A smaller number of women of European origin from the Netherlands and Australia were also involved. Members of the Women’s Army Corps (WAC) pose at Camp Shanks, New York, before leaving from New York Port of Embarkation on February 2, 1945. 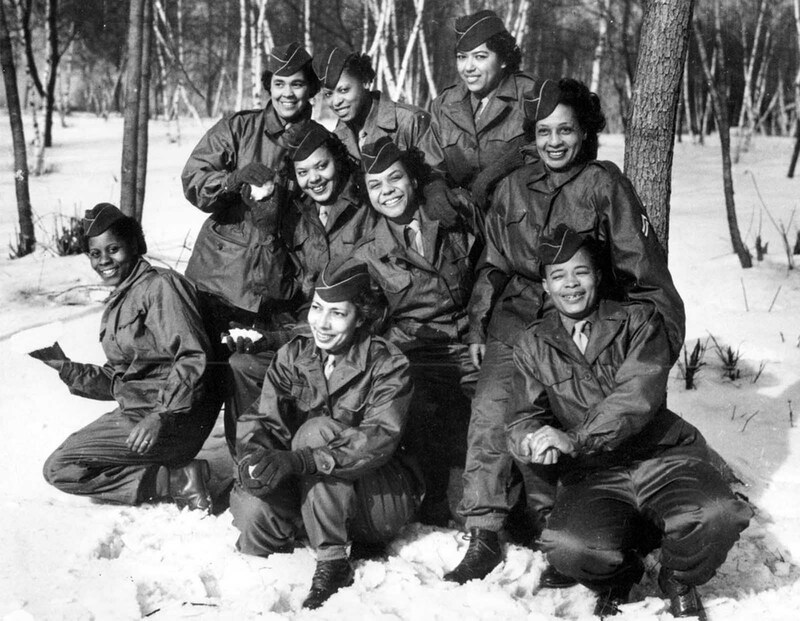 The women are with the first contingent of Black American WACs to go overseas for the war effort From left to right are, kneeling: Pvt. Rose Stone; Pvt. Virginia Blake; and Pfc. Marie B. Gillisspie. Second row: Pvt. Genevieve Marshall; T/5 Fanny L. Talbert; and Cpl. Callie K. Smith. Third row: Pvt. Gladys Schuster Carter; T/4 Evelyn C. Martin; and Pfc. Theodora Palmer. 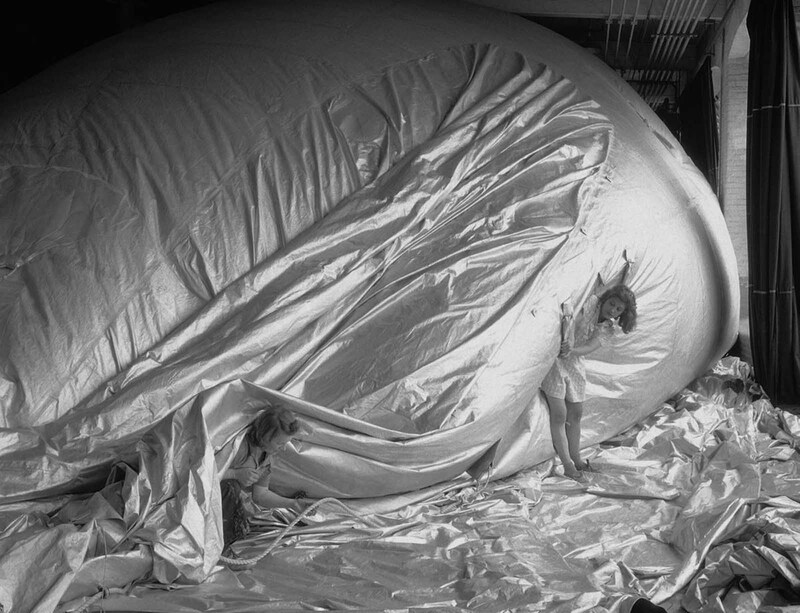 Woman workers inspect a partly inflated barrage balloon in New Bedford, Massachusetts on May 11, 1943. Each part of the balloon must be stamped by the worker who does the particular job, also by the work inspector of the division, and finally by the “G” inspector, who gives final approval. 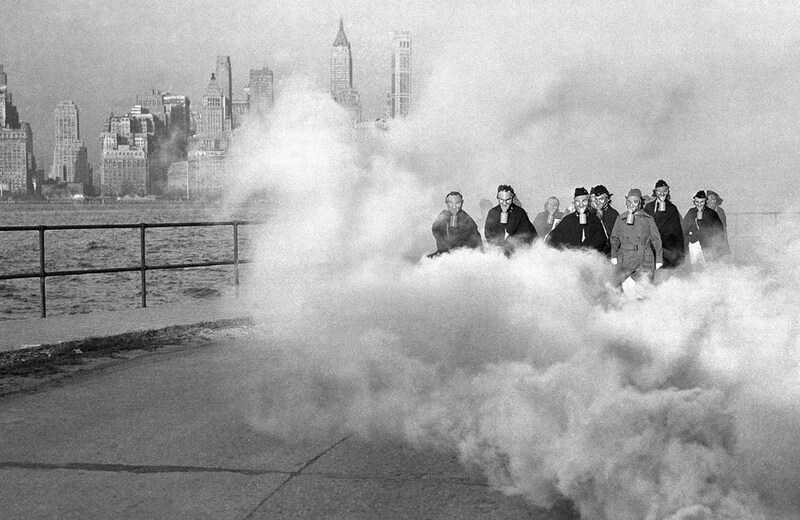 With some of New York’s skyscrapers looming through clouds of gas, some U.S. army nurses at the hospital post at Fort Jay, Governors Island, New York, wear gas masks as they drill on defense precautions, on November 27, 1941. Three Soviet guerrillas in action in Russia during World War II. 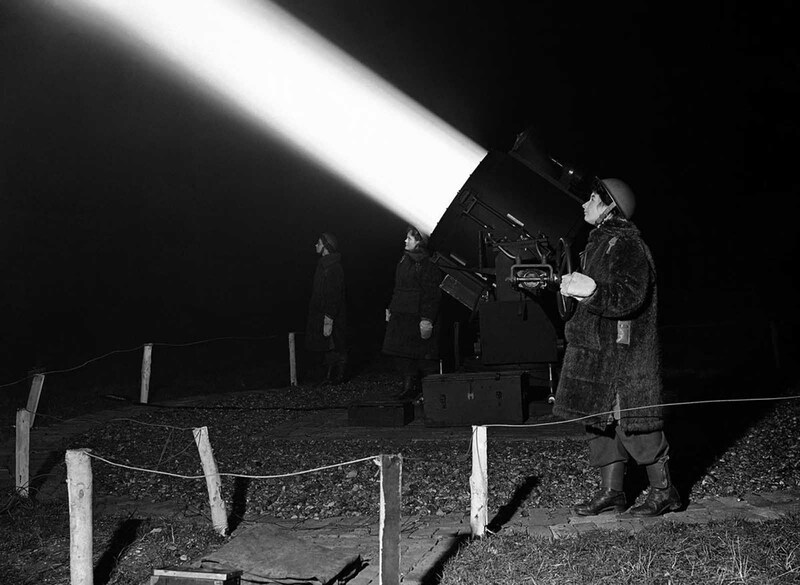 An Auxiliary Territorial Service girl crew, dressed in warm winter coats, works a searchlight near London, on January 19, 1943, trying to find German bombers for the anti-aircraft guns to hit. 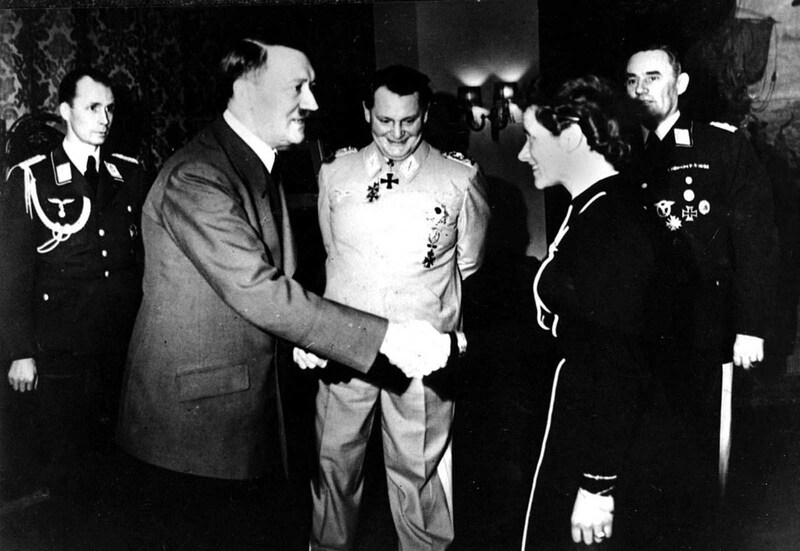 he German Aviatrix, Captain Hanna Reitsch, shakes hands with German chancellor Adolf Hitler after being awarded the Iron Cross second class at the Reich Chancellory in Berlin, Germany, in April 1941, for her service in the development of airplane armament instruments during World War II. In back, center is Reichsmarshal Hermann Goering. At the extreme right is Lt. Gen. Karl Bodenschatz of the German air ministry. In Germany – On the eve of war 14.6 million German women were working, with 51% of women of working age (16–60 years old) in the workforce. Nearly six million were doing farm work, as Germany’s agricultural economy was dominated by small family farms. 2.7 million worked in industry. When the German economy was mobilized for war it paradoxically led to a drop in female work participation, reaching a low of 41% before gradually climbing back to over 50% again. This still compares favorably with the UK and the USA, both playing catchup, with Britain achieving a participation rate of 41% of women of working age in 1944. However, in terms of women employed in war work, British and German female participation rates were nearly equal by 1944, with the United States still lagging. The difficulties the Third Reich faced in increasing the size of the work force was mitigated by reallocating labor to work that supported the war effort. 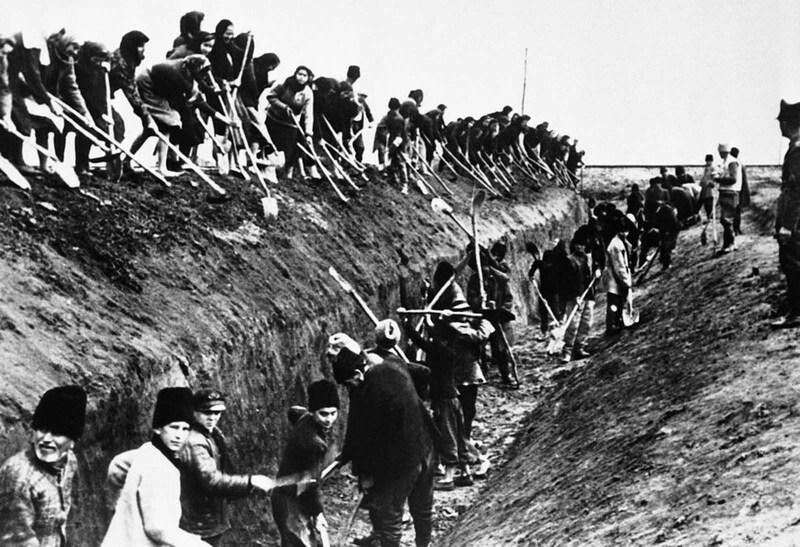 High wages in war industries attracted hundreds of thousands, freeing up men for military duties. 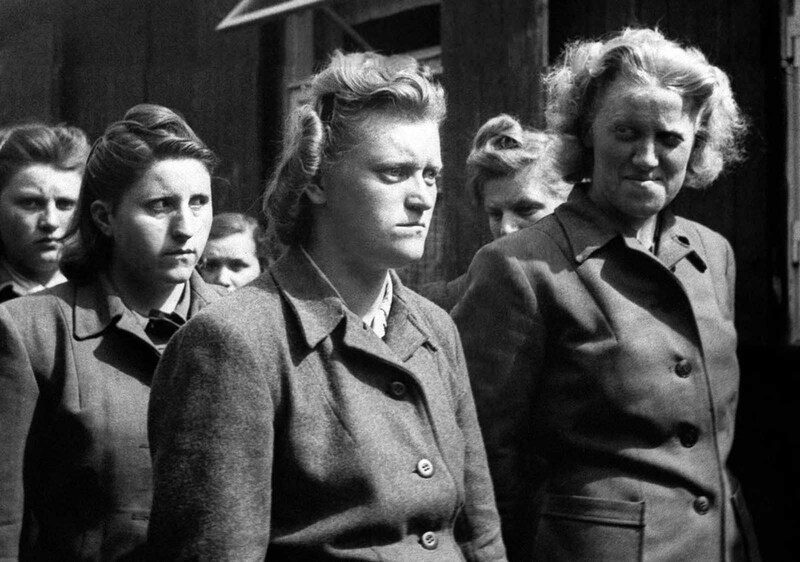 Prisoners of war were also employed as farmhands, freeing up women for other work. Germany had a very large and well organized nursing service, with four main organizations, one for Catholics, one for Protestants, the secular DRK (Red Cross) and the “Brown Nurses,” for committed Nazi women. Military nursing was primarily handled by the DRK, which came under partial Nazi control. Frontline medical services were provided by male medics and doctors. Red Cross nurses served widely within the military medical services, staffing the hospitals that perforce were close to the front lines and at risk of bombing attacks. Two dozen were awarded the Iron Cross for heroism under fire. In Italy women joined the anti-fascist resistance, and also served in the fascist army of Mussolini’s rump state that formed in 1943. They did not serve in the main Italian army. Some 35,000 women (and 170,000 men) joined in the Resistance. However the women ‘staffetta’ were used only as auxiliary support and were not allowed in senior ranks. Most did cooking and laundry duty. Some were guides, messengers, and couriers near the front lines. A few were attached to small attack groups of five or six men engaged in sabotage. Some all-female units, engaged in civilian and political action. 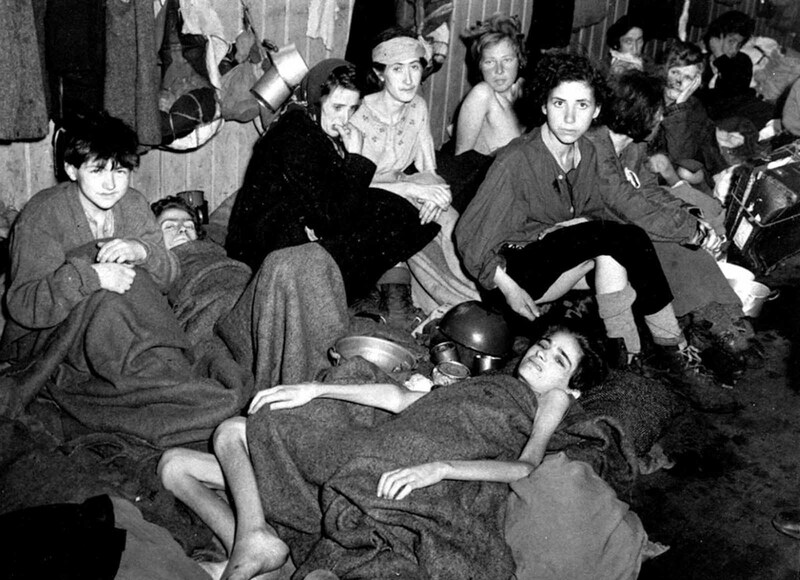 The Germans aggressively tried to suppress them, sending 5000 to prison, deporting 3000 to Germany. About 650 died in combat or by execution. On a much larger scale, non-military auxiliaries of the Catholic Centro Italiano Femminile (CIF) and the leftist Unione Donne Italiane (UDI) were new organizations that gave women political legitimacy after the war. Mussolini’s Salo Republic, a puppet state of the Germans, gave their women roles as “birthing machines” and as noncombatants in paramilitary units and police formations (Servizio Ausiliario Femminile). The commander was the brigadier general Piera Gatteschi Fondelli. The Soviet Union mobilized women at an early stage of the war, integrating them into the main army units, and not using the “auxiliary” status. More than 800,000 women served in the Soviet Armed Forces during the war, which is roughly 3 percent of total military personnel, mostly as medics. About 300,000 served in anti-aircraft units and performed all functions in the batteries—including firing the guns. A small number were combat flyers in the Air Force, forming 3 bomber wings and joining into other wings. 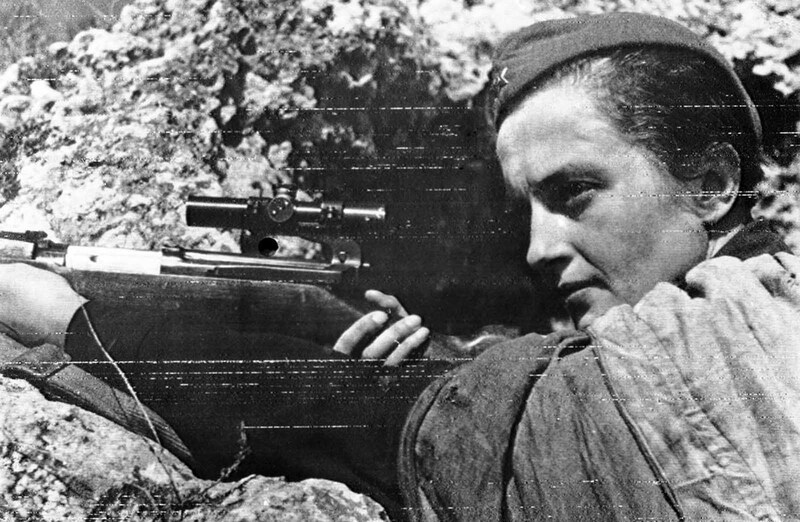 Women saw also combat in infantry and armored units, and female snipers became famous after commander Lyudmila Pavlichenko made a record killing 309 nazis (mostly officers and enemy snipers). Throughout World War II, women appeared in Soviet war propaganda in various capacities. 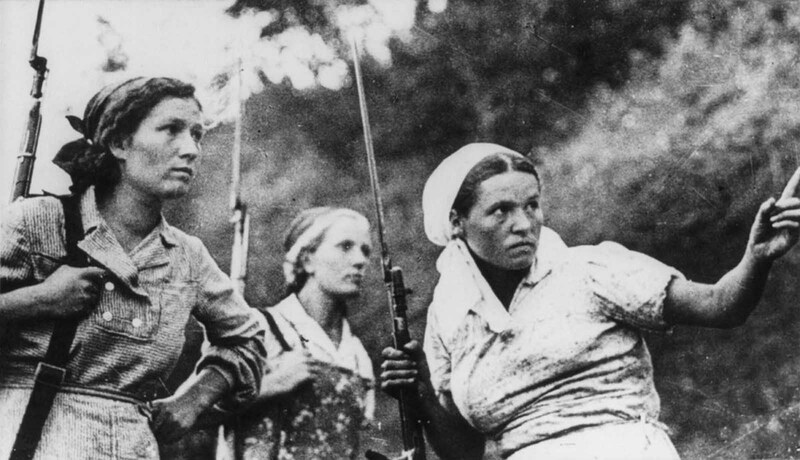 Between 1939 and 1941, wary of German militarism and expansionism, Soviet propaganda encouraged women to undertake paramilitary civil defense training. After the German invasion in 1941, propaganda portrayed women participating in war-related industries, in the medical sector, or in partisan units. Before the severe manpower shortages of 1942, women were prohibited from serving in combat positions, and Soviet propaganda celebrated women’s contributions on the home front. In March 1942, when the People’s Commissariat of Defense began enlisting women to replace male casualties in some combat roles, Soviet propaganda began honoring individual war heroines. The USSR utilized propaganda celebrating heroic servicewomen to recruit more female soldiers. As a result, the state directed these stories only towards female workers that could be spared for front line service. Magazines for women in industrial jobs, such as Rabotnitsa, called upon readers to fulfill their patriotic duty and take up arms like other brave female soldiers. Since agricultural work was vital for the war effort, articles for peasant women addressed females only as partisans. Media coverage ignored the broader contribution of female soldiers and concealed the number of women in combat positions. As the number of female soldiers increased, state media could no longer ignore their contribution to the war effort. When designated for a broader audience, propaganda emphasized the femininity of female soldiers, who were portrayed as pretty, energetic, and spirited. These women kept culture alive in the male dominated units, encouraging cleanliness among their male comrades. Propaganda represented older female soldiers as motherly figures, caring for the male soldiers, while younger women assumed a sisterly image. In this context, Soviet propaganda depicted the armed forces as a family, courageously defending the motherland against the Fascist invasion. 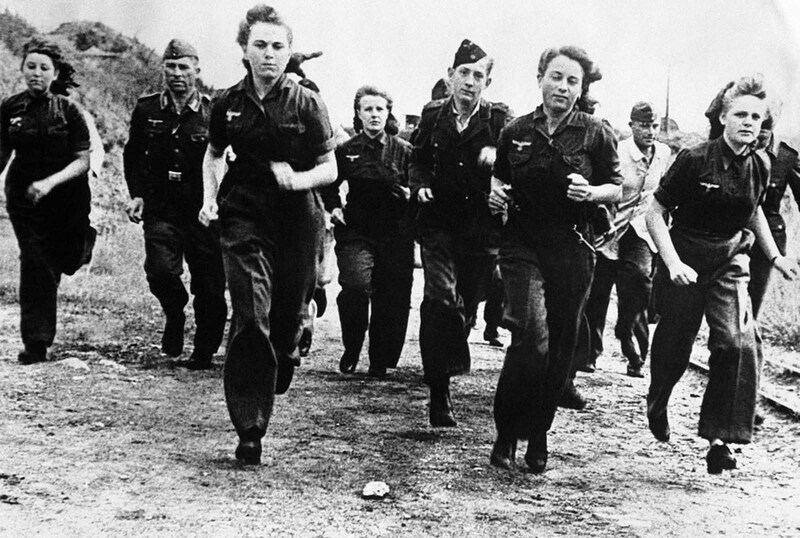 More and more girls are joining the Luftwaffe under Germany’s total conscription campaign. They are replacing men transferred to the army to take up arms instead of planes against the advancing allied forces. Here, German girls are shown in training with men of the Luftwaffe, somewhere in Germany, on December 7, 1944. Specially chosen airwomen are being trained for police duties in the Women’s Auxiliary Air Force (WAAF). They have to be quick-witted, intelligent and observant woman of the world – They attend an intensive course at the highly sufficient RAF police school – where their training runs parallel with that of the men. 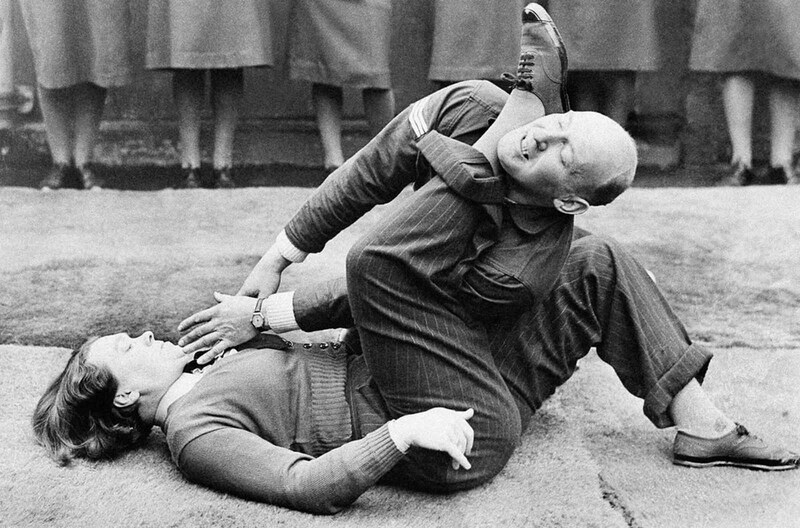 Keeping a man “in his place” – A WAAF member demonstrates self-defense on January 15, 1942. When Britain went to war, as before in World War I, previously forbidden job opportunities opened up for women. Women were called into the factories to create the weapons that were used on the battlefield. Women took on the responsibility of managing the home and became the heroines of the home front. According to Carruthers, this industrial employment of women significantly raised women’s self-esteem as it allowed them to carry out their full potential and do their part in the war. During the war, women’s normative roles of “house wife” transformed into a patriotic duty. As Carruther’s put it, the housewife has become a heroine in the defeat of Hitler. The roles of women shifting from domestic to masculine and dangerous jobs in the workforce made for important changes in workplace structure and society. During the Second World War, society had specific ideals for the jobs in which both women and men participated in. 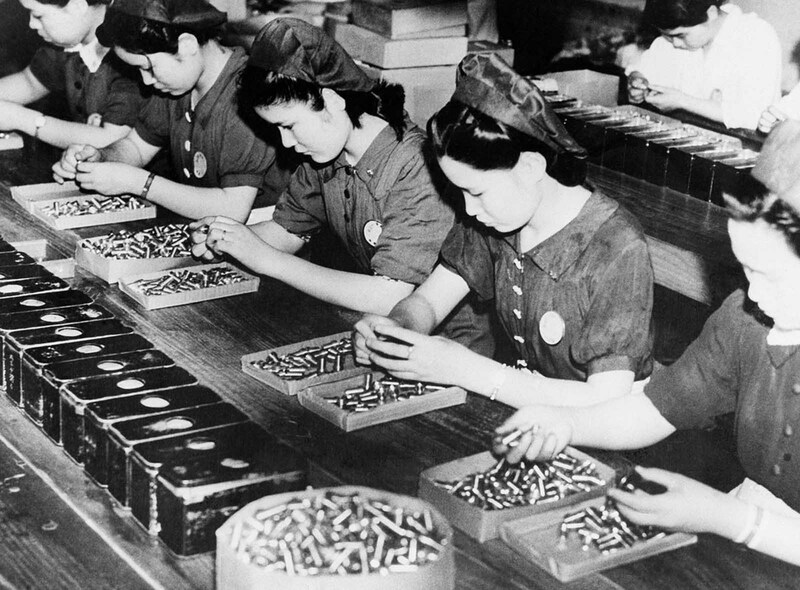 When women began to enter into the masculine workforce and munitions industries previously dominated by men, women’s segregation began to diminish. 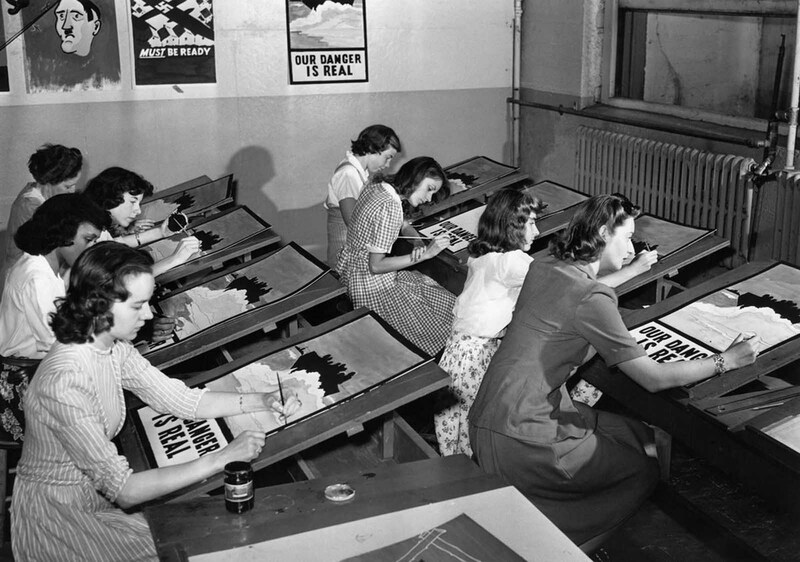 Increasing numbers of women were forced into industry jobs between 1940-1943. As surveyed by the Ministry of Labour, the percentage of women in industrial jobs went from 19.75 per cent to 27 per cent from 1938-1945. It was very difficult for women to spend their days in factories, and then come home to their domestic chores and care-giving, and as a result, many women were unable to hold their jobs in the workplace. Britain underwent a labour shortage where an estimated 1.5 million people were needed for the armed forces, and an additional 775,000 for munitions and other services in 1942. It was during this ‘labour famine’ that propaganda aimed to induce people to join the labour force and do their bit in the war. Women were the target audience in the various forms of propaganda because they were paid substantially less than men. It was of no concern whether women were filling the same jobs that men previously held. Even if women were replacing jobs with the same skill level as a man, they were still paid significantly less due to their gender. In the engineering industry alone, the number of skilled and semi-skilled female workers increased from 75 per cent to 85 per cent from 1940-1942. According to Gazeley, even though women were paid less than men, it is clear that women engaging in war work and taking on jobs preserved by men reduced industrial segregation. In Britain, women were essential to the war effort. The contribution by civilian men and women to the British war effort was acknowledged with the use of the words “Home Front” to describe the battles that were being fought on a domestic level with rationing, recycling, and war work, such as in munitions factories and farms and men were thus released into the military. Women were also recruited to work on the canals, transporting coal and munitions by barge across the UK via the inland waterways. These became known as the ‘Idle Women’, initially an insult derived from the initials IW, standing for Inland Waterways, which they wore on their badges, but the term was soon adopted by the women themselves. Many women served with the Women’s Auxiliary Fire Service, the Women’s Auxiliary Police Corps and in the Air Raid Precautions (later Civil Defence) services. Others did voluntary welfare work with Women’s Voluntary Service for Civil Defence and the salvation Army. 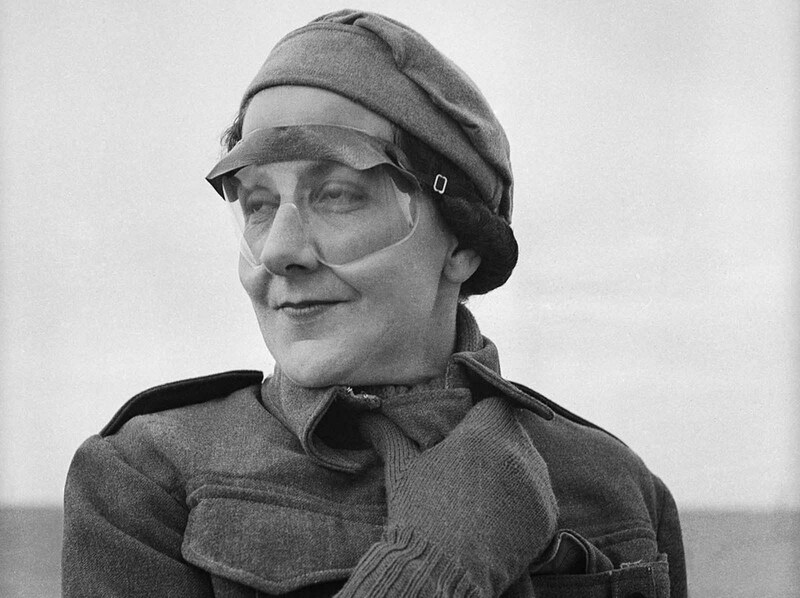 Women were “drafted” in the sense that they were conscripted into war work by the Ministry of Labour, including non-combat jobs in the military, such as the Women’s Royal Naval Service (WRNS or “Wrens”), the Women’s Auxiliary Air Force (WAAF or “Waffs”) and the Auxiliary Territorial Service (ATS). Auxiliary services such as the Air Transport Auxiliary also recruited women. In the early stages of the war such services relied exclusively on volunteers, however by 1941 conscription was extended to women for the first time in British history and around 600,000 women were recruited into these three organizations. In these organizations women performed a wide range of jobs in support of the Army, Royal Air Force (RAF) and Royal Navy both overseas and at home. These jobs ranged from traditionally feminine roles like cook, clerk and telephonist to more traditionally masculine duties like mechanic, armourer, searchlight and anti- aircraft instrument operator. British women were not drafted into combat units, but could volunteer for combat duty in anti-aircraft units, which shot down German planes and V-1 missiles. 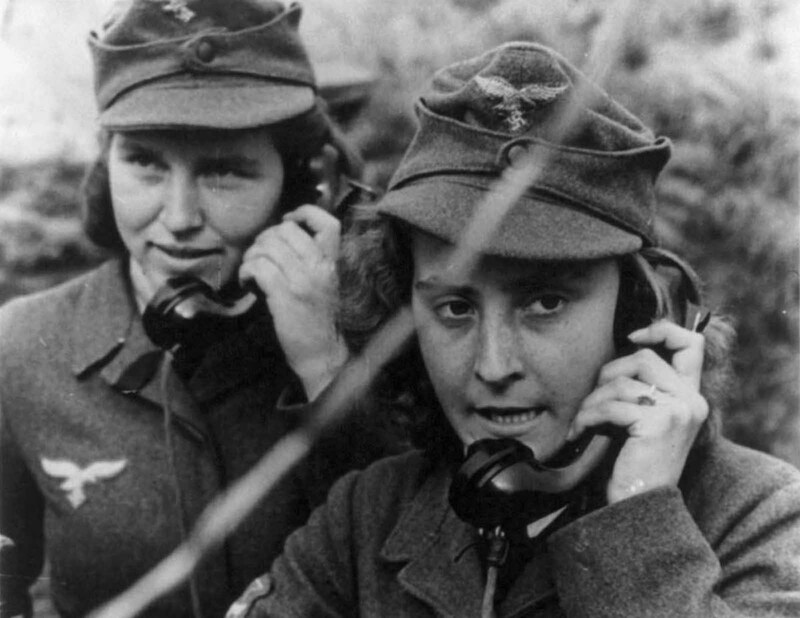 Civilian women joined the Special Operations Executive (SOE), which used them in high-danger roles as secret agents and underground radio operators in Nazi occupied Europe. 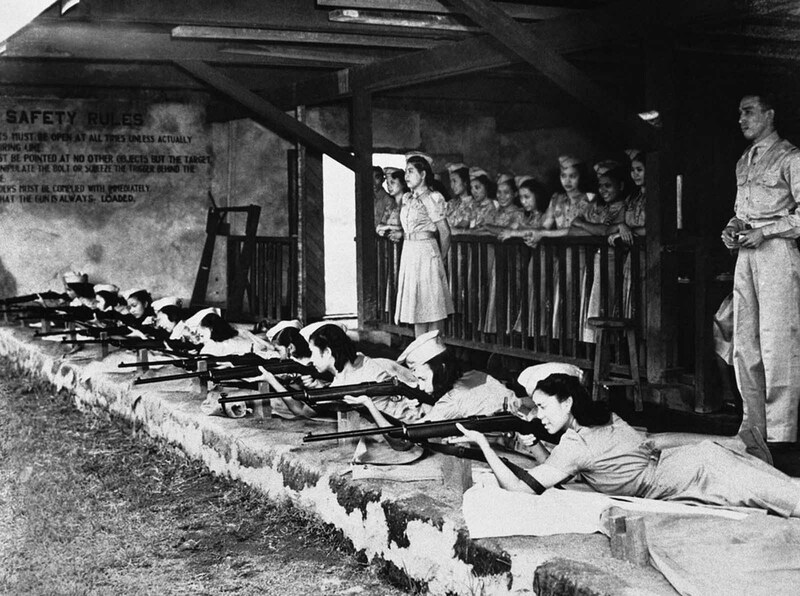 The first “Women Guerrilla” corps has just been formed in the Philippines and Filipino women, trained in their local women’s auxiliary service, are seen here hard at work practicing on November 8, 1941, at a rifle range in Manila. Little known to the outside world, although they have been fighting fascist regimes since 1927, the Italian “Maquis” carry on their battle for freedom under the most hazardous conditions. Germans and fascist Italians are targets for their guns; and the icy, eternally snow-clad peaks of the French-Italian border are their battlefield. 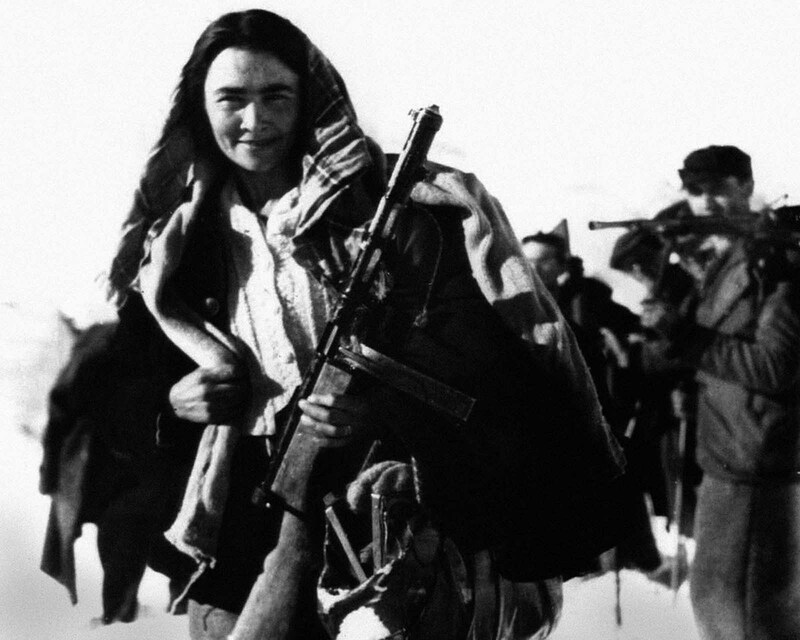 This school teacher of the Valley of Aosta fights side-by-side with her husband in the “White Patrol” above the pass of Little Saint Bernard in Italy, on January 4, 1945. 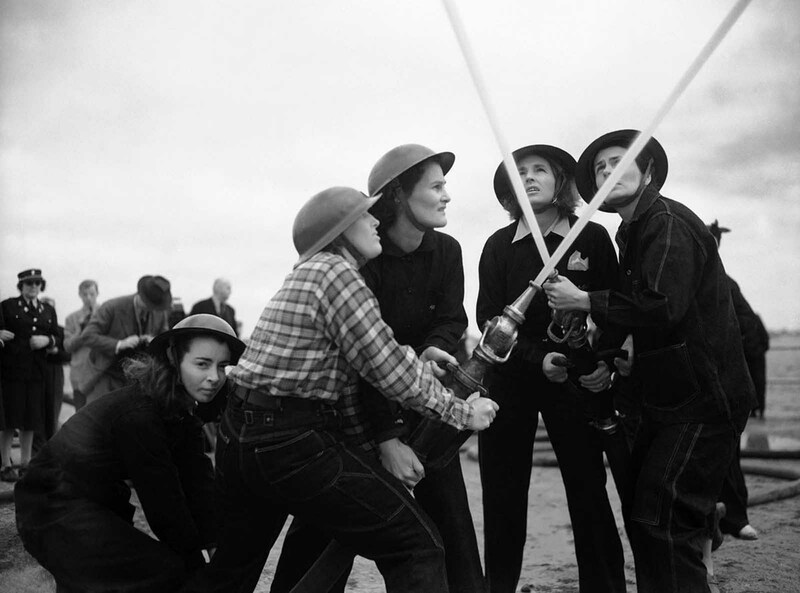 Women of the defense corps form a “V” for victory with crossed hose lines at a demonstration of their abilities in Gloucester, Massachusetts, on November 14, 1941. 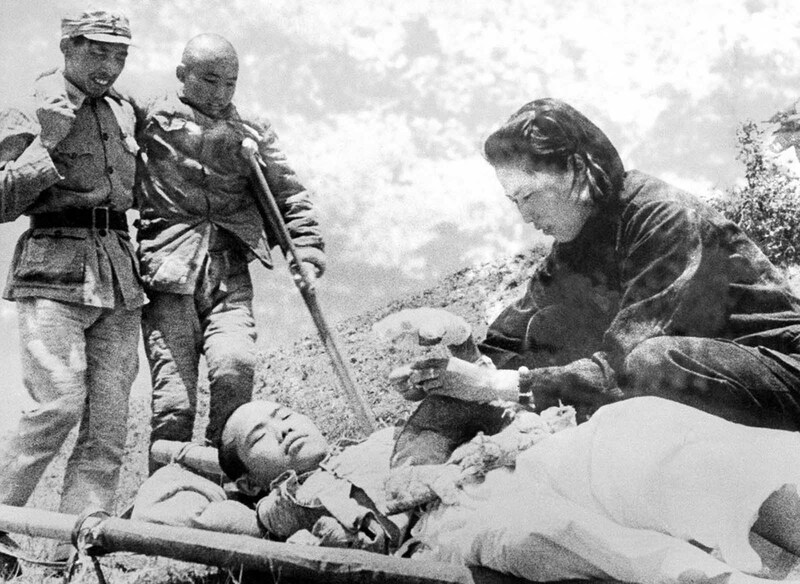 A nurse wraps a bandage around the hand of a Chinese soldier as another wounded soldier limps up for first aid treatment during fighting on the Salween River front in Yunnan Province, China, on June 22, 1943. 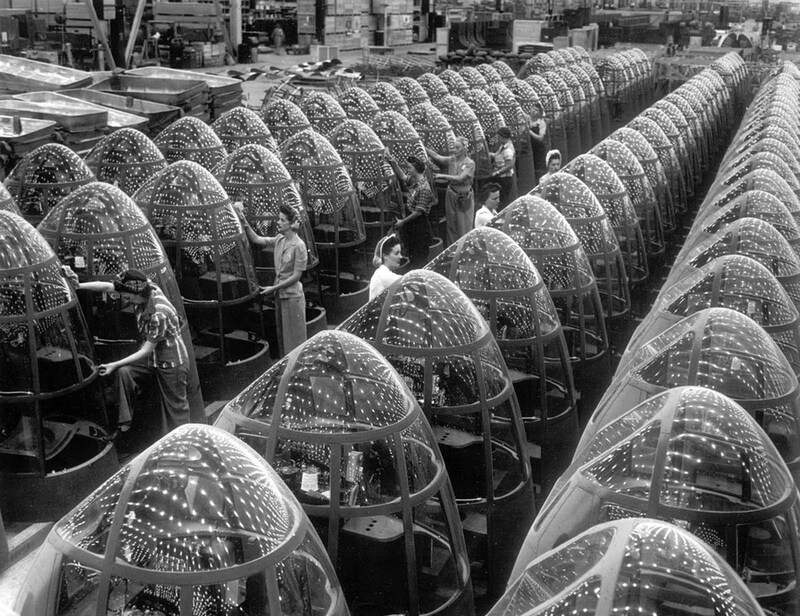 Women workers groom lines of transparent noses for the A-20J attack bombers at Douglas Aircraft’s in Long Beach, California, in October of 1942. 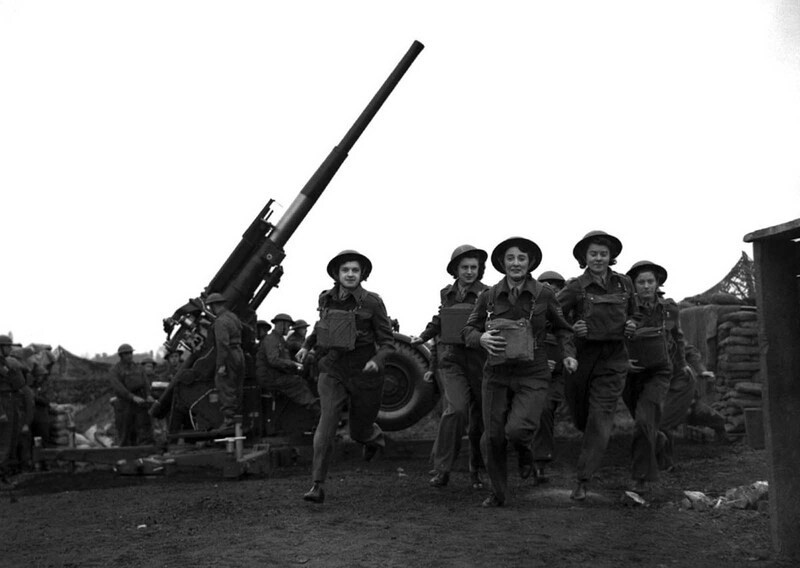 Ack-Ack Girls, members of the Auxiliary Territorial Service (ATS), run to action at an anti-aircraft gun emplacement in the London area on May 20, 1941 when the alarm is sounded. 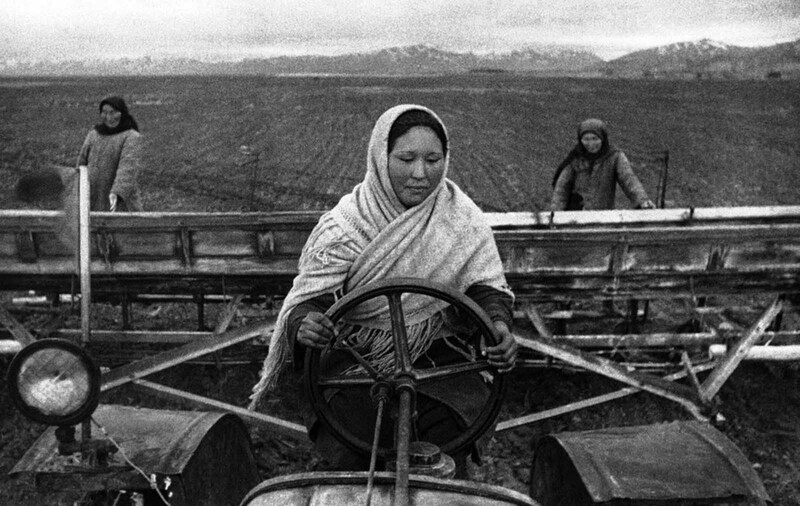 Young Soviet girl tractor-drivers of Kirghizia (now Kyrgyzstan), efficiently replace their friends, brothers and fathers who went to the front. Here, a girl tractor driver sows sugar beets on August 26, 1942. 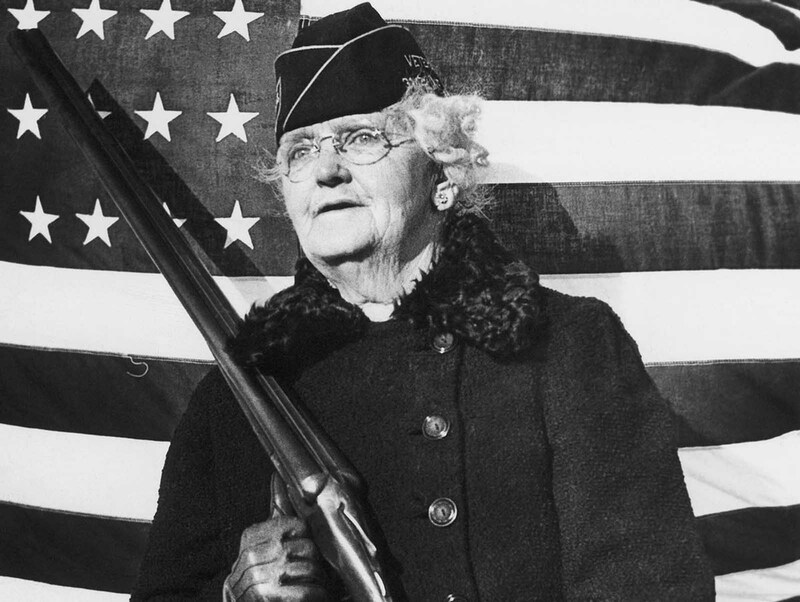 Mrs. Paul Titus, 77-year-old air raid spotter of Bucks County, Pennsylvania, carries a gun as she patrols her beat, on December 20, 1941. Mrs. Titus signed-up the day after the Pearl Harbor attack. “I can carry a gun any time they want me to,” she declared. 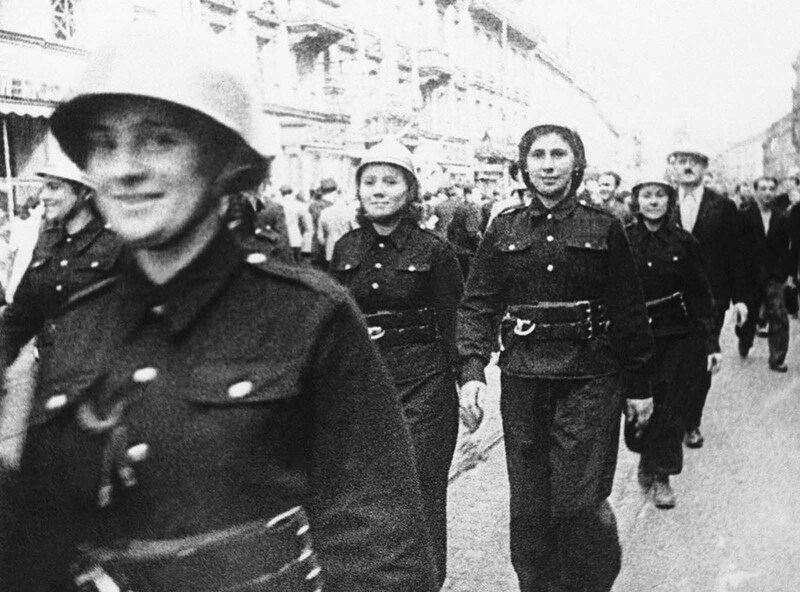 Steel-helmeted, uniformed Polish women march through the streets of Warsaw to aid in defense of their capital after German troops had started their invasion of Poland, on September 16, 1939. 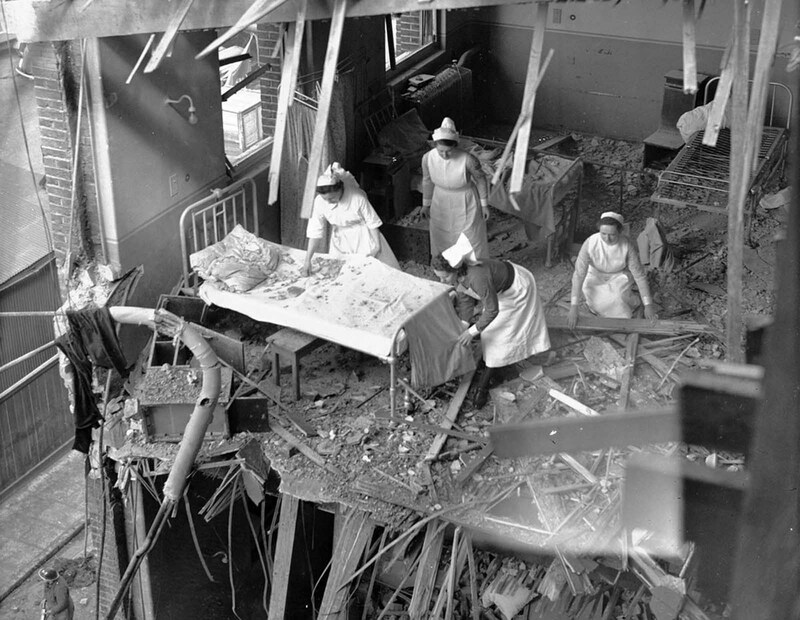 Nurses are seen clearing debris from one of the wards in St. Peter’s Hospital, Stepney, East London, on April 19, 1941. Four hospitals were among the buildings hit by German bombs during a full scale attack on the British capital. 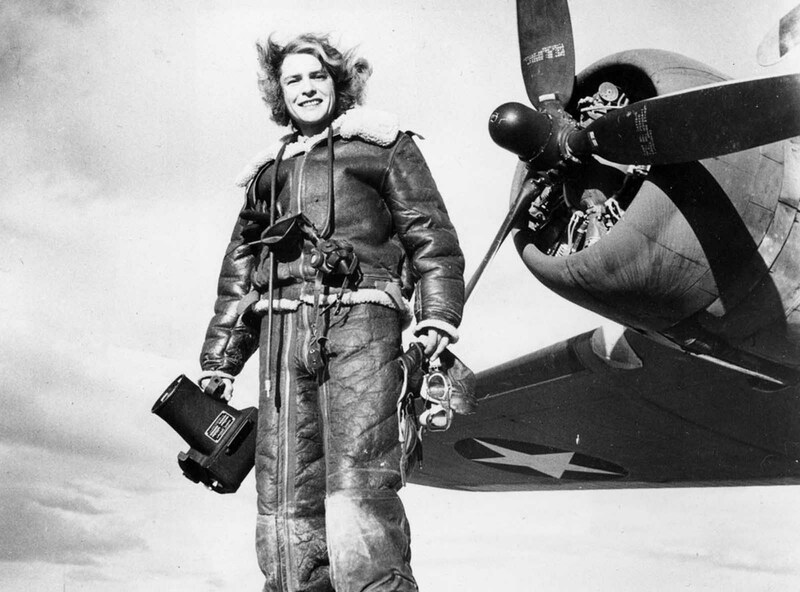 Life magazine photojournalist Margaret Bourke-White wears high-altitude flying gear in front of an Allied Flying Fortress airplane during a World War II assignment in February 1943. 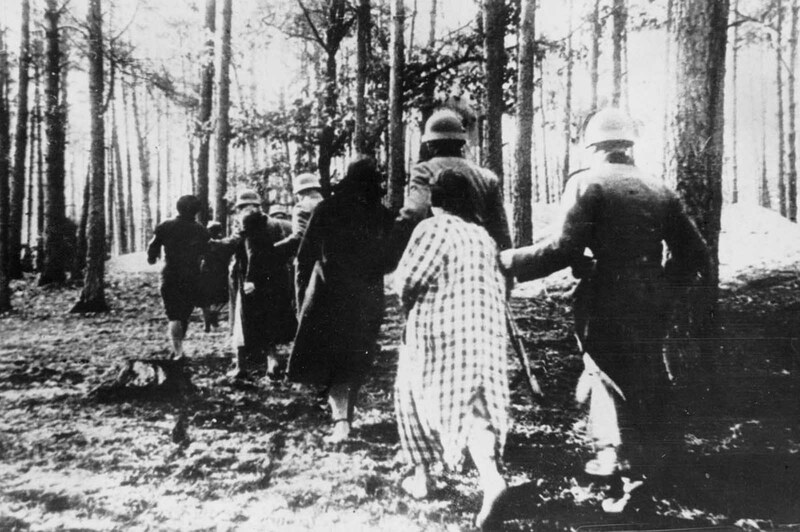 Polish women are led through woods to their executions by German soldiers sometime in 1941. 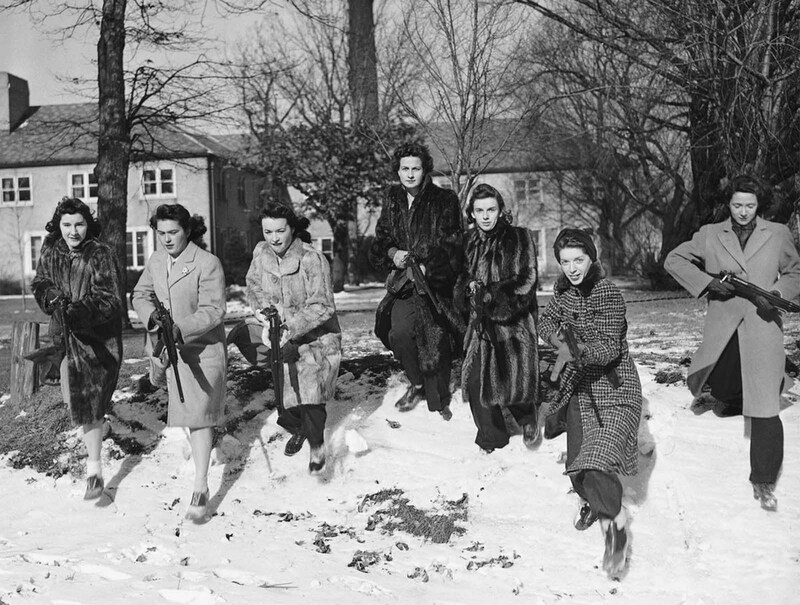 These Northwestern University girls brave freezing weather to go through a Home Guard rifle drill on the campus in Evanston, Illinois on January 11, 1942. From left to right are: Jeanne Paul, age 18, of Oak Park, Illinois,; Virginia Paisley, 18, of Lakewood, Ohio; Marian Walsh, 19, also from Lakewood; Sarah Robinson, 20, of Jonesboro, Arkansas,; Elizabeth Cooper, 17, of Chicago; Harriet Ginsberg, 17. As they await assignment to their permanent field installations, these Army nurses go through gas mask drill as part of the many refresher courses being given them at a provisional headquarters hospital training area somewhere in Wales, on May 26, 1944. 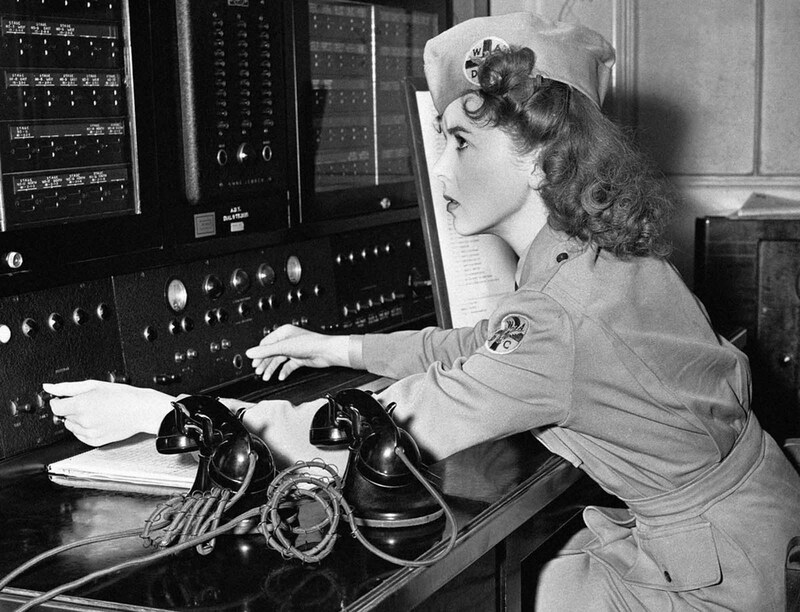 Movie actress Ida Lupino, is a lieutenant in the Women’s Ambulance and Defense Corps and is shown at a telephone switch board in Brentwood, California, on January 3, 1942. In an emergency she can reach every ambulance post in the city. It is in her house and from here she can see the whole Los Angeles area. The first contingent of U.S. Army nurses to be sent to an Allied advanced base in New Guinea carry their equipment as they march single file to their quarter on November 12, 1942. The first four in line from right are: Edith Whittaker, Pawtucket, Rhode Island,; Ruth Baucher, Wooster, O.; Helen Lawson, Athens, Tennessee,; and Juanita Hamilton, of Hendersonville, North Carolina. 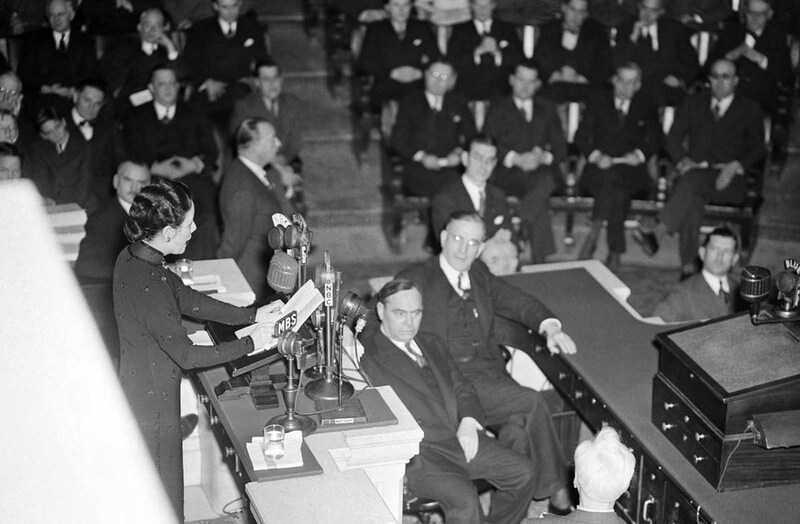 With practically every member present, the U.S. House of Representatives in Washington, District of Columbia, hears its second woman speak other than a member, as Madame Chiang Kai-Shek, wife of China’s Generalissimo, pleads for maximum efforts to halt Japan’s war aims on February 18, 1943. 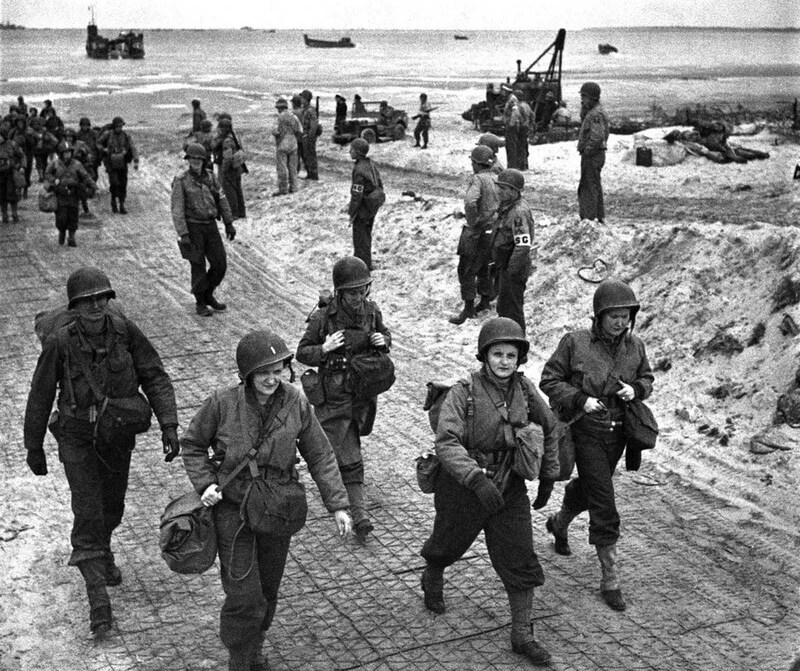 U.S. nurses walk along a beach in Normandy, France on July 4, 1944, after they had waded through the surf from their landing craft. They are on their way to field hospitals to care for the wounded allied soldiers. 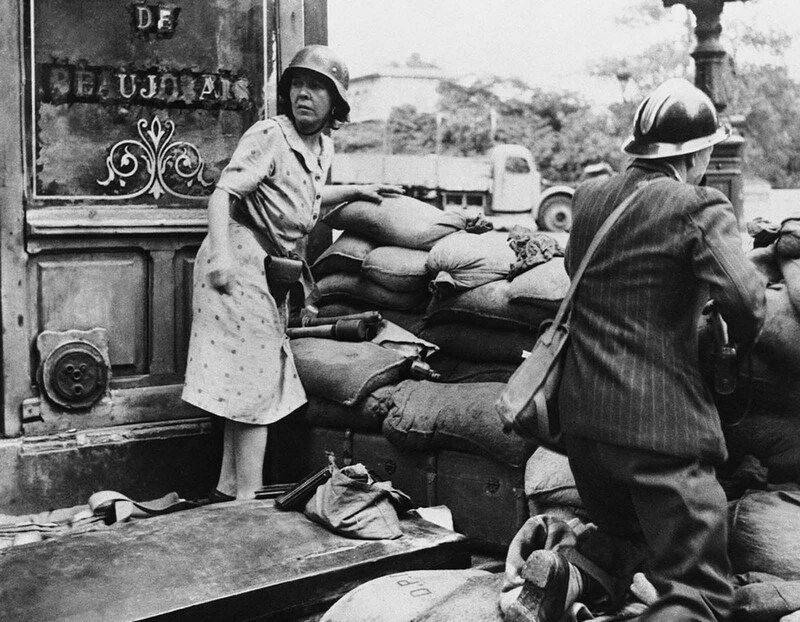 A French man and woman fight with captured German weapons as both civilians and members of the French Forces of the Interior took the fight to the Germans, in Paris in August of 1944, prior to the surrender of German forces and the Liberation of Paris on August 25. A German soldier, wounded by a French bullet, is disarmed by two members of the French Forces of the interior, one a woman, during street fighting that preceded the entry of allied troops into Paris in 1944. 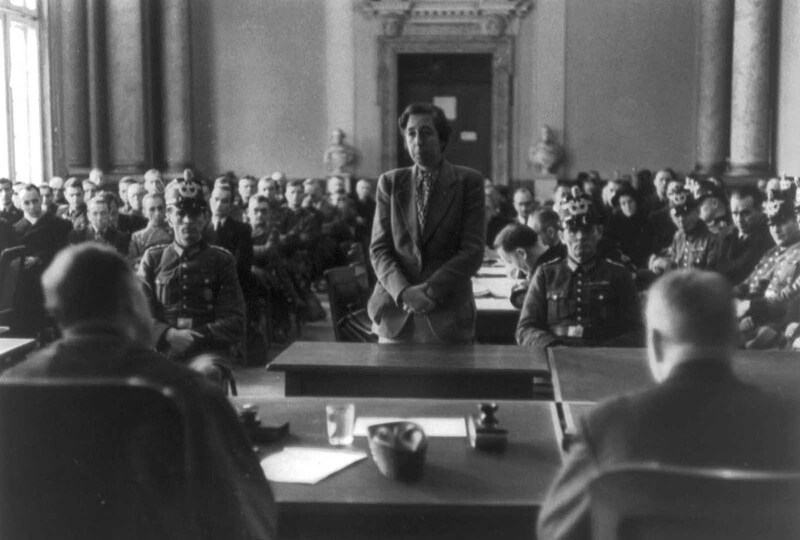 Elisabeth “Lilo” Gloeden stands before judges, on trial for being involved in the attempt on Adolf Hitler’s life in July 1944. Elisabeth, along with her husband and mother, was convicted of hiding a fugitive from the July 20 Plot to assassinate Hitler. The three were executed by beheading on November 30th, 1944, their executions much-publicized later as a warning to others who might plot against the German ruling party. An army of Romanian civilians, men and women, both young and old, dig anti-tank ditches in a border area, on June 22, 1944, in readiness to repel Soviet armies. Miss Jean Pitcaithy, a nurse with a New Zealand Hospital Unit stationed in Libya, wears goggles to protect her against whipping sands, on June 18, 1942. 62nd Stalingrad Army on the streets of Odessa (The 8th Guard of the Army of General Chuikov on the streets of Odessa) in April of 1944. 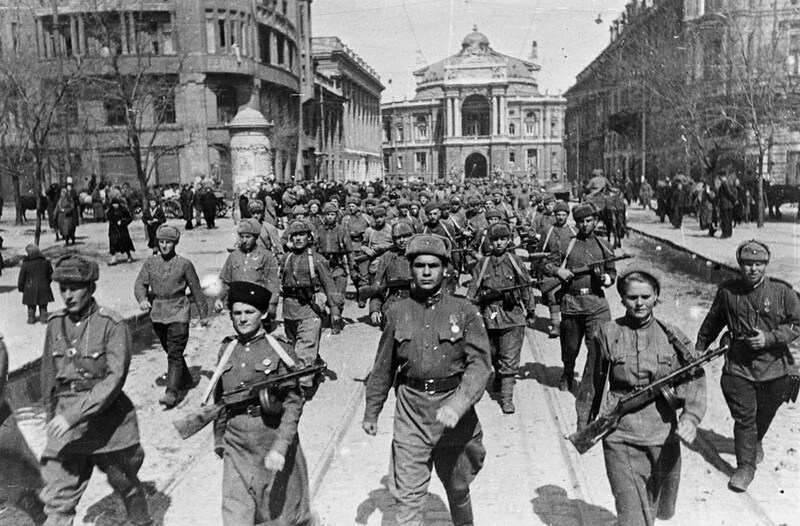 A large group of Soviet soldiers, including two women in front, march down a street. 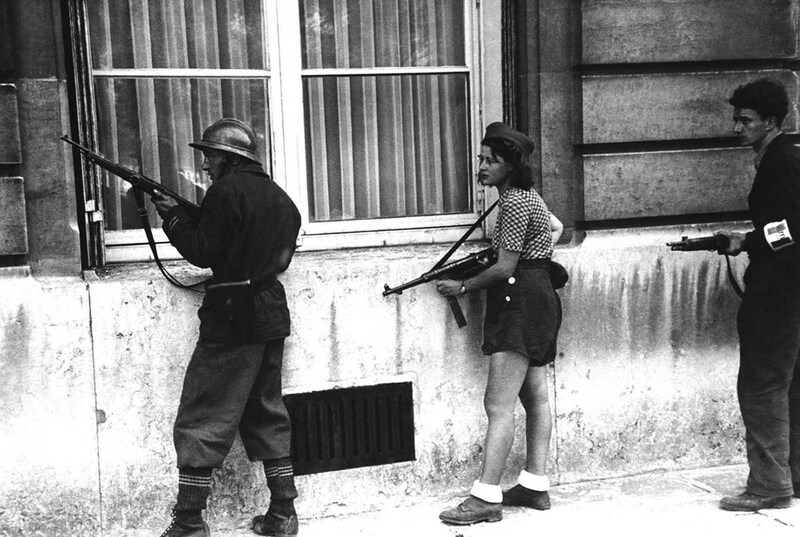 A girl of the resistance movement is a member of a patrol to rout out the Germans snipers still left in areas in Paris, France, on August 29, 1944. The girl had killed two Germans in the Paris Fighting two days previously. 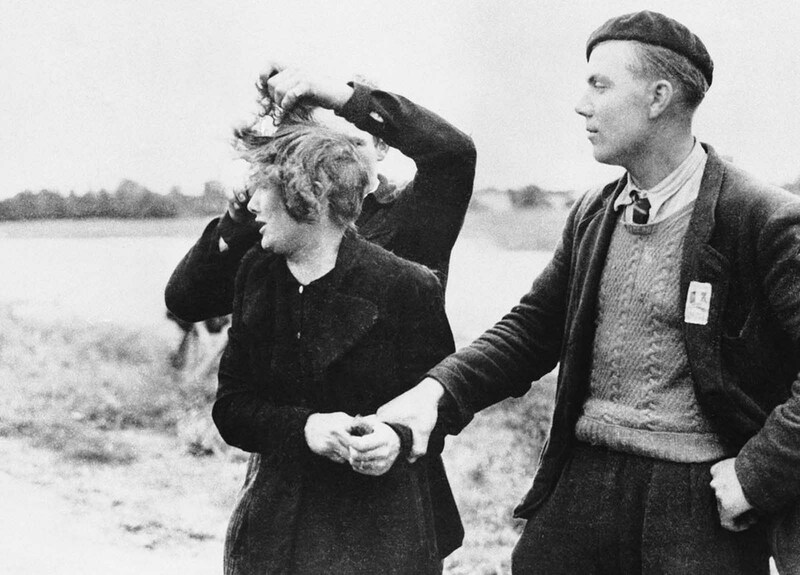 Grande Guillotte of Normandy, France, pays the price for being a collaborationist by having her hair sheared by avenging French patriots on July 10, 1944. Man at right looks on with grim satisfaction at the unhappy girl. 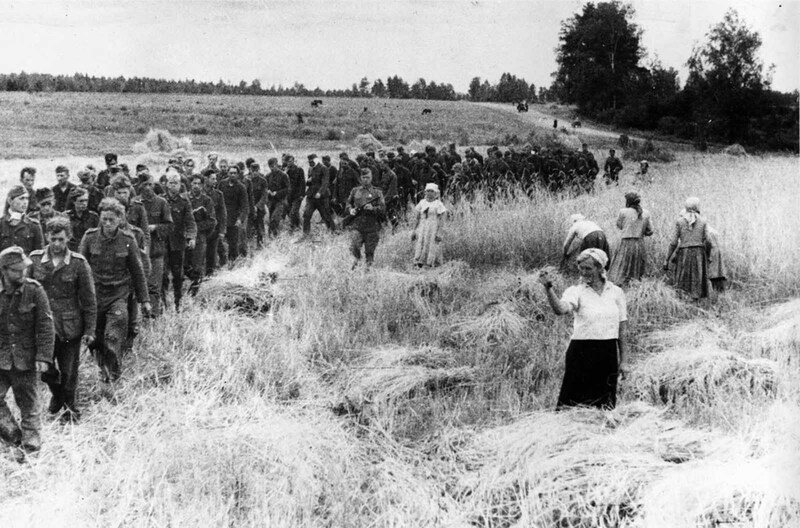 A Soviet woman, harvesting a field torn by shells only a short time ago, shakes her fist at German prisoners of war as they march eastward under Soviet guard in the U.S.S.R., on February 14, 1944. (Photo credit: AP / Library of Congress).